No that is not photochopped, and yes they went live with these over the weekend. Whether or not Mr. Sterling saw them or not is irrelevant: the fact that fans of every color are united against racism and his alleged idiotic beliefs is what’s truly relevant, and will come through in the end. 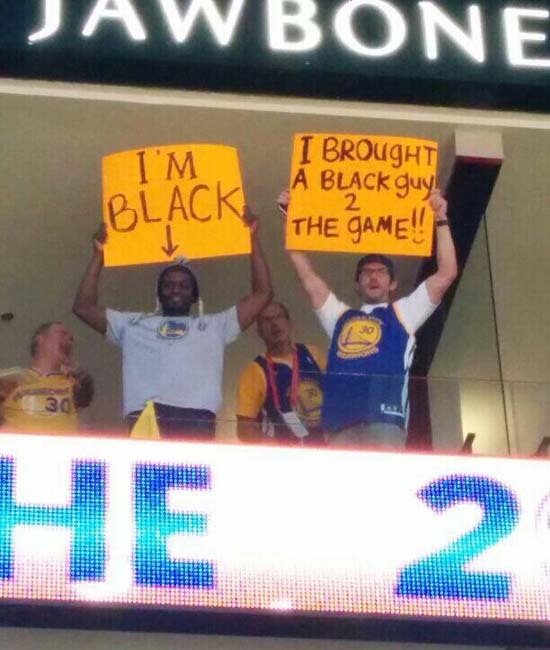 To these two Golden State Fans, this Chicago Bulls fan salutes you! For all of our funny pics here at SQ just head on over to our official funny pics site tag – we’re always adding more! I read this article on SQ and found it very interesting, thought it might be something for you. The article is called Warrior Fans Heckle Donald Sterling With Signsand is located athttps://www.slightlyqualified.com/warrior-fans-heckle-donald-sterling-with-signs-funny-pic.